40 years ago Saint Vitus had its roots as Tyrant. It took 21 years to team up with their original singer Scott Reagers again and now, 24 years later there’s a new album coming up! First make sure to listen to the very first single from the new album, which came with the announcement. The album will be self-titled (once again after their 1984 debut) and is out due May 17 via Season Of Mist. “12 Years In The Tomb” has a very raw sound, which evolves in very fuzzy guitars, but starts with wild and jungle-esque drumming. The overall vibe gets very gritty and retro-sounding in its production. Reagers adds his unconventional singing that makes the song’s verse sound like an old-school punk tune with a solid metal undertone. The song’s bridge features great doom elements that summit with the singing of Reagers, before the guitars get very experimental and psychy. It’s a trippy experience when listening to “12 Years In The Tomb”. Fans of older Saint Vitus releases will love it for its stoner-aspect as well as the very organic and raw sound. Die Healing was the last album with Reagers and released in 1995. In between the band released four albums with singer Wino Weinrich [Born Too Late (1985), Mournful Cries (1988), V (1990), Lillie F-65 (2012)], who left the band in 2015, again. 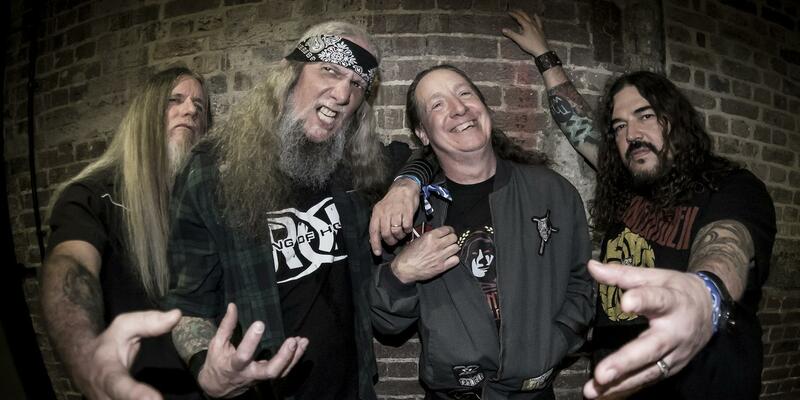 Saint Vitus (2019) will also be the first album to feature Patrick Bruders (Down, ex-Crowbar), who replaced long-time bassist and founding member Mark Adams. The band will be touring on 40 years of band history with Dopelord and Telepathy this spring. The tour dates are to be found in the poster. The album will be released on May 17 via Season Of Mist. Get your pre-orders now and follow the band on Facebook! Previous PostAnderson .Paak Already Announces New Album "Ventura" and Tour for This Summer!